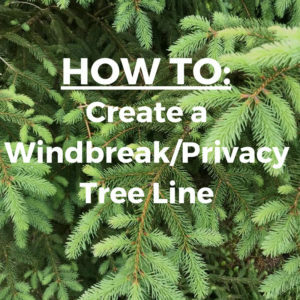 How do I get started on my windbreak or privacy screening tree installation process? First, selecting trees that will grow and mature in your zone is very important. Across the United States, specific trees adapt to soil and climate better than others. Evergreen trees are most commonly known for windbreak or privacy screening purposes. This particular species will provide home-owners with the best coverage, while maintaining color year-round. Ranging from small 2-3 ft. trees to 7 ft. or higher depending on your budget and plans for your home. A low crown tree is the best selection for covering the entirety of the area used. Heating and cooling a house can take a large hit on a home-owners budget. Installing a windbreak system that will best suit your home will in return reduce the cost of your heating bill. By strategically placing these trees, the exposure of wind that your house intakes will be significantly lower. After you begin your tree selection process, you should plan the install process. It’s best to consider the distance where these trees are being planted. Commonly used trees such as evergreen species will reach 20-60 ft. tall and spread an average of 10-20 ft. wide. Placing these trees two to four times its mature height away for your house is the best practice for ensuring enough space. The most ideal placing for windbreak systems would be the north and northwest part of your home. This way your home will not suffer from receiving passive solar heat from the winter sun coming from the south side. In addition to your bill reduction, you are doing a service to the environment. Our eco-system is dependent on trees so taking action to plant a tree or multiple trees provides our earth with many benefits. Now that you have information about all of the amazing attributes tree screenings can do for yourself and the environment, consider Kickapoo Creek Nursery as a resource! We have an assortment of spruce, pine, cedar, arborvitae, and fir trees ready to be installed or delivered to your home or business!